How Do You Move a Space Shuttle? This Thing. Since the Space Shuttle couldn't very well fly itself to the launch pad, NASA had to figure out how to get $1.7 billion worth of spacecraft from the Vehicle Assembly Building the the Launch Pad. 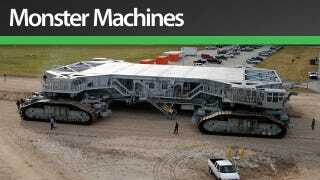 Their solution: the 2700-ton Crawler-Transporter. Problem solved. Standing 20-26 feet high, 131 feet wide, and 114 feet long, each vehicle—nicknamed "Hans" and "Franz"—consists of four sets of double tracks, each weighing nearly 60 tons (that's one Bowhead Whale's worth). Four 1,000 kw generators powering the vehicle's traction motors—themselves powered by two 2,750hp diesel engines—make the crawlers move. Another pair of 750 kw generators, driven by dual 1,065 hp diesel engines, provide power for the lighting, accessories, and self-leveling deck. The Crawler-Transporter gallops along the 3.5 mile reinforced crawlerway from the VAB to the launch site at a blistering two miles an hour (and only half that when loaded), consuming 437 gallons of diesel along the way. Since the start of their service in 1965, they've traveled a combined 2,526 miles (roughly the distance between Mazatlan and Vancouver).